There was ictory for the men from the Kingdom in a very hard fought game at Swilly Park on Sunday where Fanad United scored late to win 1-0. Meanwhile Letterkenny Rovers won again, this time 5-0 against Finn Harps Reserves. Credit to the groundsmen for having the pitch at Swilly Park playable after the torrential rain on Saturday. Both teams contested a hard fought battle on an excellent playing surface. Martin Mc Elhinney was denied early on for Fanad when his goalbound effort was blocked. Caelon Kelly headed just wide on 40 minutes. The game was scoreless at the break. James Mc Cahill hit the crossbar with a fine effort after being set up by Tony Mc Namee on 50 minutes. The game burst into life then as both teams began the search for a winner. Swilly thought they had gone ahead when Shaun Crossan produced great work on the left and his cross was deflected off a Fanad defender as the inrushing Tony McNamee headed into the back of the net. The goal was deemed offside and was disallowed. Following the dismissal of James McCahill on 73, the game swung from end to end as both teams sought a winner. The winner arrived on 92 minutes when Davitt Walsh released Ryan McFadden and he knocked home from six yards. Swilly: Gareth Muldoon, Duncan Patterson, Shaun Crossan, Ciaran Toland, Dylan Hegarty, James Mc Cahill, David Fisher, Aaron Rogan, Kennedy Boache, Tony Mc Namee, Marty Mc Daid. Subs: Ciaran Mc Hugh, Ryan Mc Daid, Brandon Wilkie, Matthew Mc Laughlin, Jordan Nugent (for Aaron Rogan), Frank Mc Brearty and Brad Patterson. Fanad: Mark Anthony McGinley, Conor McNulty, Conor Blaney, Shaun McElwaine, Oisin Langan, Caelon Kelly, Paddy Carr, Dean McCarry, Martin McElhinney, Davitt Walsh, Edward O'Reilly. Subs: Marty McAteer, Ryan McFadden, Peter Curran, James Gallagher and Eoghan Jordan. 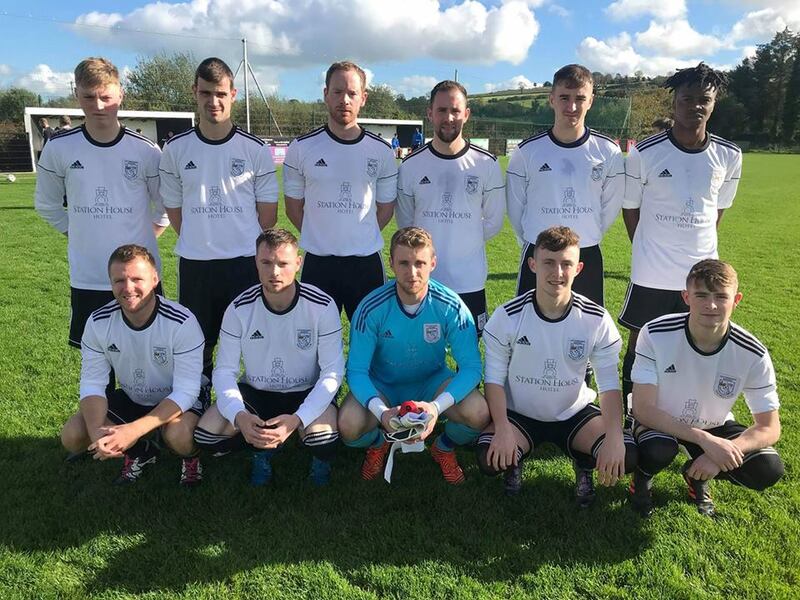 Letterkenny Rovers made it three wins from three in this season's Ulster Senior League with a comfortable 5-0 win over Finn Harps Reserves in glorious conditions at Leckview Park on Sunday afternoon. The heavy rain which enveloped the county on Saturday had no impact on an excellent surface and it wasn't long before the home side stamped their authority on the game and after wasting a number of early opportunities scored three goals in the space of nine minutes to kill the game off at half-time. Rovers took the lead on 22 minutes and it was a well worked move which saw the outstanding Conor Tourish drive out of defence before playing interchanging passes with BJ Banda. Tourish then fed Declan Sharkey who fired low past Harps custodian Joe Boyle. That settled Rovers and they doubled their advantage on 27 minutes when again Tourish was the instigator with a long diagonal ball finding the cultured Johnny Bonner and his low left footed effort gave Boyle no chance. Tourish then extended the advantage when heading home Bonner's corner on 31 minutes to make it 3-0. Harps to their credit started the second half brighter and pressed for a way back into the game and forced a number of corners but didnt overly threaten Rovers keeper Rory Kelly. Any lingering hopes of a comeback were put to bed when Banda made it 4-0 on 58 minutes when he capitalised on a loose pass on the halfway line before driving on and firing a left footed effort low to the bottom corner giving Boyle no chance. Mark McAteer saw his effort for Harps go narrowly over the bar while Chris Malseed flashed one just over in a game full of chances. But the goal of the game - and the loudest cheer of the day - was reserved for the evergreen Darren McElwaine when his sublime chipped effort from 25 yards beat retreating goalkeeper Joe Boyle after a defensive lapse on 82 minutes. Harps are back in league action next week when traveling to Fanad Utd while Rovers welcome Cockhill Celtic in the Intermediate Cup. Subs; Darren McElwaine for Banda 60 mins, Brian McVeigh for Conaghan 64 mins, Paul McVeigh for Nelis 70 mins, Ryan Lonergan for McGrath 76 mins, Johnathan Coady for Malseed 81 mins. Finn Harps Reserves: Joe Boyle, Jordan Gallagher, Pat Loughrey, Ryan Finn, Keelin McGill, Stephen Doherty, Zach Gorman, Liam Walsh, Adam Duffy, Darren McElwaine, Tom Mullan. Subs used: Mark McAteer, Brendan Barr and Darragh Ellison.